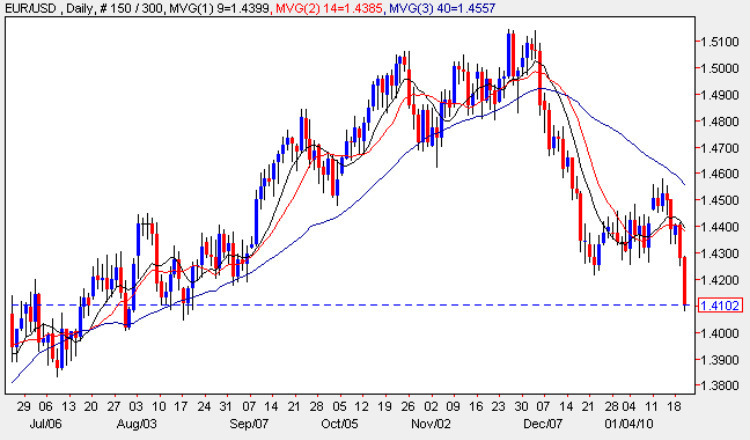 Fears about Greece were duly confirmed today with the eurodollar adding further momentum to the already bearish picture and trading down throughout the day with a very wide spread candle which not only breached the potential support at USD1.4250 but also plunged midway through to the next level of major price congestion. Adding to the euro’s woes has been speculation that China will be tightening lending and thus bringing to a halt the recent rise in equities as markets turn risk averse once again. The recent sideways consolidation from mid December now presents a serious level of potential resistance to any upwards move and with this evening’s price breaching the USD1.41 level we could see further downwards pressure to re-test the USD1.38 of current congestion in due course. At the current rate of decline we could even see USD1.40 achieved before the end of the week. With all three technical indicators now pointing sharply lower and last month’s sideways action merely a pause, the current trend for the eurodollar is certainly bearish for the short to medium term and should the USD1.38 floor then a much deeper move back towards USD1.30 beckons. From a fundamental perspective yesterday’s ZEW figures certainly added to the pessimistic mood both of which came in worse than expected, declining for the fourth month in a row, and today’s German PPI adding further to the gloom coming in at -0.1% against a forecast of +0.2%. Meanwhile in the US it was positive news with building permits higher than expected at 0.65m against a forecast of 0.59m and which built on yesterday’s very encouraging TIC data which came in hugely above estimate at 126.8bn against a forecast of 30.3bn.